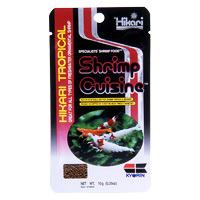 Rich in vegetable matter herbivorous shrimp prefer, especially seaweed and spirulina. The highly natural ingredient mix offers the necessary mineral profile for proper ecdysis (shedding). Contains copper which is necessary for blood regeneration.